The central controlling unit of the smoke device is our SmokeDriver. Controlled by processors, this small and lightweight element supervises the operation of the smoke device. You simply connect the SmokeDriver on a free receiver output. Through the MPX connectors you then connect the smoke pipe(s), the SmokePump, and the LiPo batteries with the SmokeDriver. The magnetic valve is only available with the Twin system. The SmokeDriver supervises the voltage of the LiPo batteries and safely switches the system off once the proper discharge voltage is reached. Since the interrupting voltage is 3.3 volt per cell, and thus higher than the discharge limit of the LiPo batteries, you can use the main power unit to power the smoke device. 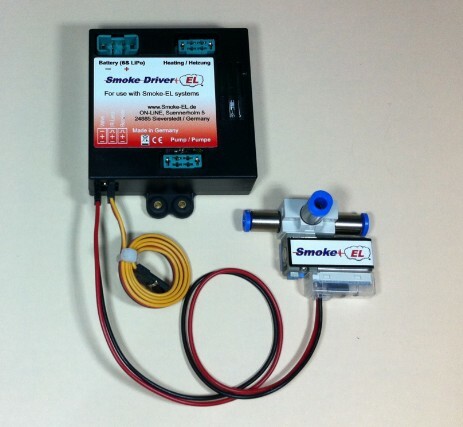 To satisfy most battery set-ups we offer various SmokeDriver systems. The working voltage for the SmokeBlock is 12 volt (lead or 3S-LiPo batteries). The SmokePipes need at least 6S LiPo batteries, and at most 12S-LiPo batteries if using an HV system. Our new GF-Smoke Driver (from August 2016) includes an acceleration sensor (MEMS) and thus measures the acceleration perpendicular to the wings (positive and negative). In addition to manual switching the Smoke system is activated automatically when an adjustable acceleration value is exceeded with this SmokeDriver. As soon as the acceleration falls below the threshold, the smoke is switched off again. Thus, the vortices can now be simulated at the wingtips. The configuration of the GF-SmokeDriver can be done via the transmitter or, quite simply, the Smoke-Systems terminal via your Smartphone. The app can be downloaded from the Googel Store. Note that the GF-SmokeDriver requires JR connector for the smoke pump. An adapter cable is available as an accessory. From 2017 the HV- and the G-Foce SmokeDriver are telemetry able. In order to use telemetry, you need the teleconverter. Automatic switch-off at 3.3 volt per cell. MPX-connectors for the batteries are included. The SmokeDriver is already included in our starter sets. 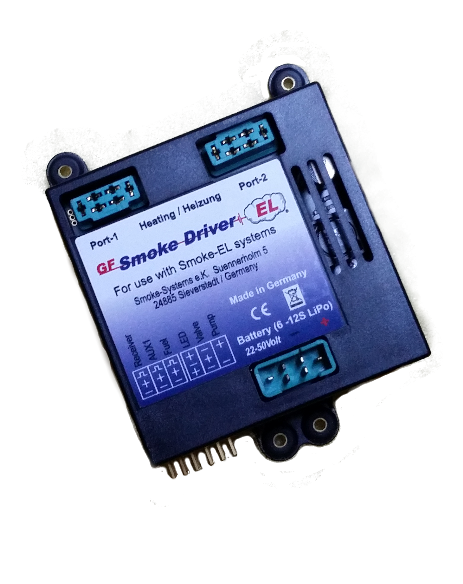 The SmokeDriver supervises and controls all functions of the smoke device. There are two different versions of the SmokeDriver. Connect this LED to the AUX-Connector of your HV-SmokeDriver and get all the signals from the internal LED also at the blue external LED.